ESPNEarly reports claimed that NBA insiders would forgo the annual Twitter scooping that usually accompanies the draft every year, but ESPN’s Adrian Wojnarowski found a clever way to get around the new policy. 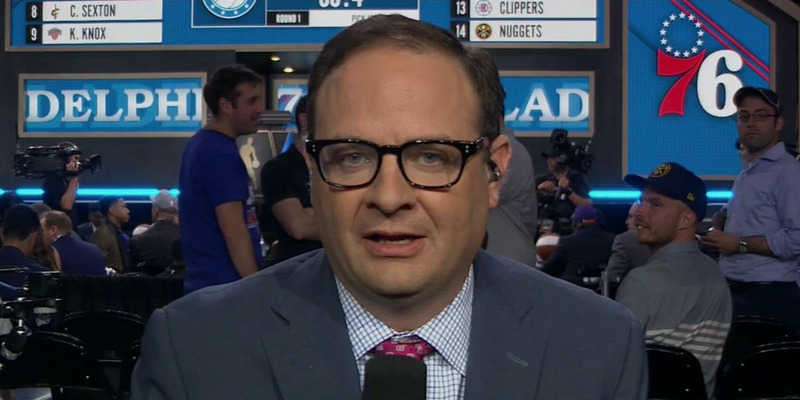 NBA insider Adrian Wojnarowski found a clever way to continue his unparalleled coverage of the NBA Draft on Thursday night. Most major media companies covering the draft reportedly agreed to not announce the picks before they happened on television. On Thursday, Woj found a workaround, employing a bit of wordplay to hint at the draft’s direction without technically reporting on the matter. The greatest tradition of the NBA Draft found a way to continue on Thursday night. The race for scoops was something that delighted NBA Twitter for years, and the art had no greater master than Adrian Wojnarowski, who made a name for himself on a national scale with his notorious ability to get ahead of the picks as they were announced on television with what became known as “WOJ BOMBS” across social media. This year, with Woj having moved from Yahoo Sports to ESPN, where the draft is broadcast, reporters were expected to keep silent, in order not to spoil the televised product. Earlier in the week,Awful Announcing’s Alex Putterman broke the news that NBA insiders would be discouraged from spoiling the draft. Here's how the Top 6 of tonight's NBA Draft is taking shape: 1. Suns: Deandre Ayton. 2. Kings: Marvin Bagley Jr.; 3. Hawks: Luka Doncic; 4. Jaren Jackson, Jr.; 5. Mavericks: Mo Bamba; 6. Magic: Trae Young. While a trade between the Hawks and Mavericks threw that initial prediction off after four picks, the tweet made clear that Wojnarowski was not prepared to completely give up his spot as the president of NBA Twitter on draft nights. Not surprisingly, all these teams picked these players. @wojespn / TwitterWoj wasn’t ready to relinquish the throne just yet. 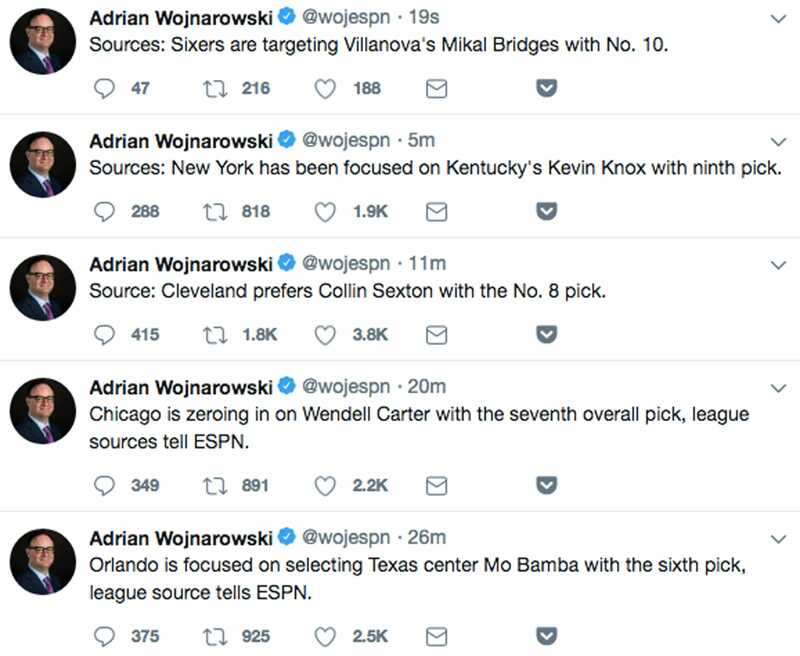 These tweets still kept with Woj’s tradition of being the first to break all news relating to the draft, but differed from his previous years in one significant way – they were never written as definitives. By shifting his language a bit to focus more on what teams were “focused” on doing, Woj found himself a little wiggle room that allowed him to continue beating the broadcast with his Twitter feed. The people of NBA Twitter quickly picked up on what Woj was doing, and expressed their appreciation. Wojnarowski hinted to the New York Times that his style wouldn’t be changing this year, despite the edict that had reportedly been handed down. “I will be aggressive in breaking news, including trades, trade talks and delivering our audience up-to-the-moment reporting and direction on which players teams are planning to select in the draft,” Wojnarowski said. 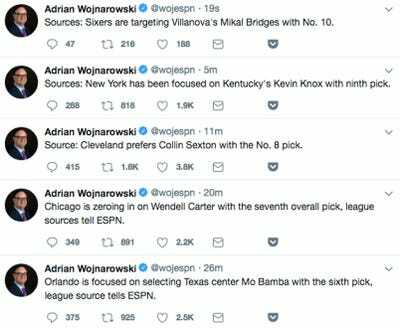 The whole situation just goes to show – if there is NBA news to be reported, Woj will find a way.